This item was recovered from the City of London in the late 1950's. period are hard to find with so much stem remaining. due to frost action or the expansion of natural salts or gypsum in the soil. This does make the appearance a lot less than perfect but due to its rarity still desirable to a serious collector. The smoking chamber is about 1cm across at the rim - really tiny. This group includes all as shown in the image. Four pipe bowls which are from the c.1740-60 period found in the area of Salisbury, UK. The style of bowl represented by the shapes in this group is typical for that area at that time so these are a good typology group. Condition varies with a little rust on the bowls, however, this can be cleaned up using acid if you have a mind to do that which would improve them dramatically, or I could do that for you (takes about 4 days). A group of broken pipe pieces found in fields near Barnstaple in North Devon, UK. These vary in date from the mid 17th century to mid 19th century. Some of the heel fragments have a makers mark stamped on the base as shown in the images here. A couple of bowls are complete. Everything in the photos is included in this purchase. Postage and packing included in the price. These are in nice condition and represent a variety of the typical egg-shaped pipe bowls which are unique to Holland. All c. 1750-1840 in date They all have makers marks on spur. The surfaces of Dutch pipes are lovely and smooth due to being carefully burnished when made which was all done by hand in a labour intensive process. This purchase includes all shown in the photo as well as postage and packing. Nice condition very large clay pipe bowl depicting the head of Santa! No clay pipe collection should be without one of these show pipes. They were originally produced c.1900 for Christmas and New Year celebrations. The face on this pipe is very striking and displays well and originally they were made as show pipes though occasionally they are found smoked. Three complete pipes with a basket design on the bowl and twirls on the stems. I believe these are fairly recent productions from Germany. They are fine for smoking and you get all three pipes as shown in the image for the price. Clay pipe stem necklace. Ideal for Reenactment, Fancy Dress, Pirate, Decoration etc. Made from old clay pipe stems dating c.1650 to c.1800. This one has some old silver-plated beads. Group of Three Pipe Bowls including: Armorial design and the word Edward or Ward on the stem, perhaps the Ward family of Doncaster, Inn design with a basket of flowers and a beer barrel on the other side, Coiled Rope design. These date from about 1880-1915. Made by myself, this is a piece of art based on a scaled up mid 17th century pipe shape. I made it by shaping the bowl on the potters wheel then added a heel and a portion of stem. 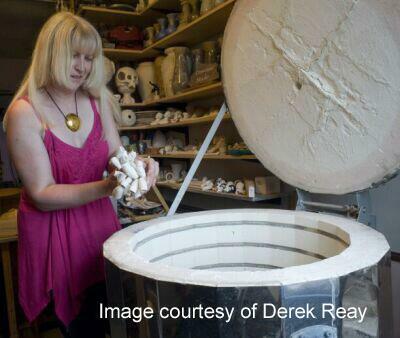 Originally my aim had been to make a stem for it also but I only ever completed the bowl part. This item might appeal as an ornament for a shelf or decorative clay pipe feature in the garden for use as a plant pot perhaps. Note it is heavy so only available for mainland UK but if you are not in the UK and want to enquire then please write so that I can quote you for postage for non-UK locations. Please do not purchase it if you are a non-UK resident but do ask first. The coffee mug (not included but also made by myself) shows the scale of this item. PRICE INCLUDES POSTAGE & PACKING TO UK MAINLAND ONLY! Two complete clay pipes with thorn prickle design. These display well and date from c.1870-1920. The thorn design was popular on clay pipes back then and popular with collectors today as they come in many shapes and sizes. Three nice thick pipe bowls with some stem. Dating to around 1900-1940 and likely made in Scotland. Although not complete pipes these would be ideal for theatre/drama/tv as props and could be smoked. Price is for all three of them and includes the postage. Produced by the famous French firm of J.Gambier of Paris and dating from about 1860-1920 this is an unusual large pipe bowl. Gambier produced many thousands of designs right up until 1926 and their pipes have always been favoured by smokers at that time and are very collectible today. This pipe might appeal as a novelty item or if you are a Gambier pipe collector. The makers mark is on the stem. Pipes like these were produced mainly for show and as novelty items but were also passed around and smoked at clubs in the past. This one is quite heavy and has a nice smooth polished finish. This is a large "show pipe" which has the bowl and most of the stem, just the mouth end missing. The original design of this style of pipe was patented in the 1840's by a London pipe maker then other pipe makers produced similar pipes soon after and from then on through to the 1920's. This one depicts one of the 19th century Great Exhibition buildings of the time where inventions and industrial skills were shown off. Likely one of the exhibitions held in London shown here. 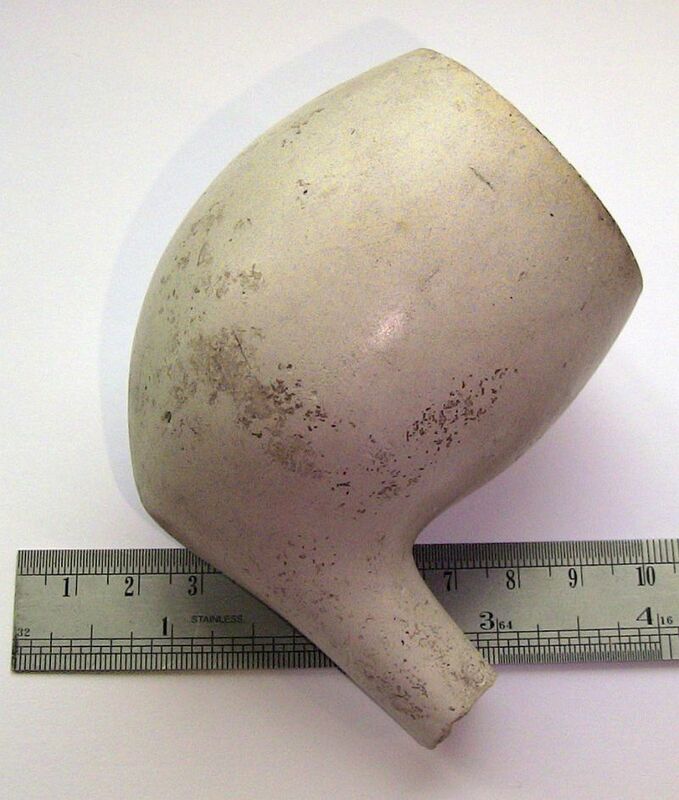 The date of this actual pipe bowl likely between c.1860 and 1910. I am not sure which maker produced this one as several in England did this design. There is a small hand-made hole at the front of the pipe which someone made to hang it up on a wall in past times. Nice display piece! Diameter of bracelet approx 7cm (2 and a half inches). Made from pipe stems dating c.1670-1800. English and Dutch stems, the long hanging stem being Dutch with some nice decorations on it. I used dark blue square glass beads and gold plated beads. Threaded on a black waxed cord. Diameter of bracelet approx 8cm (2 and three-quarter inches). Made from pipe stems dating c.1670-1800. English and Dutch stems. I used dark green square glass beads and silver-plated beads. Postage & Packing are included in all prices shown on this page! 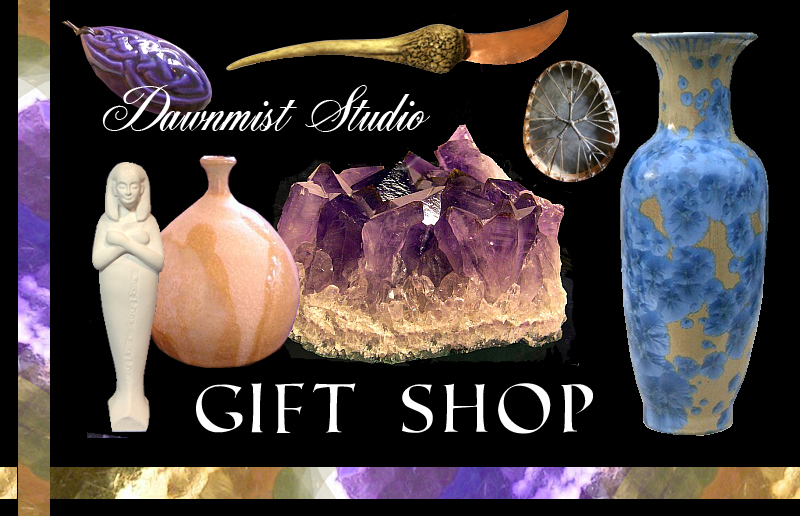 Dawnmist Studio also has a range of Pottery for sale too! 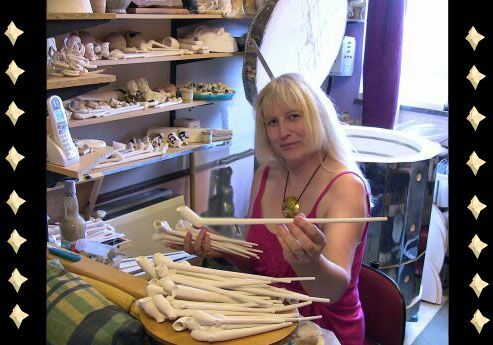 Heather and her pipes are featured in the 2011 publication "Significant Figures in Art and Craft Today" by Derek Reay. 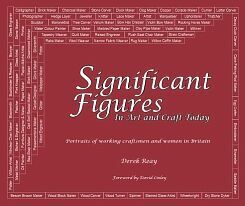 This is a 192 page, full colour, hardcover book covering a wide range of Arts and Crafts of 86 people who have made an impact in their chosen field of expertise. If you have an overall interest in arts and crafts of all kinds then this book is for you! Each of the 86 artists covered in the book are shown in their working environment in nice glossy colour photo's and there is a two page article about their work and achievments. This is the sort of book you can pick up now and then and browse through a few at a time, dipping into the arts and crafts of a wide variety of topics - the book cover reveals the multitude included. Also ideal as a gift or for a coffee table for when visitors come. PLEASE NOTE: This book is heavy and so the price given here is for customers on Mainland UK only. If you are not a UK mainland resident then please write to me first so I can give you a price quote which includes the postage to your country, thank you. Price includes postage and packing UK ONLY. NON UK residents please write first! A bronze Roman cloak fastening which originates from somewhere in Northern Europe, likely either England or France but I do not have the exact location where found. There is some decoration on the curved edge and the coiled spring on the back is still partly visible. Group of small pottery fragments that were once for study. I am fairly sure these were recovered from farmland in Kentucky, USA, however, I am not sure as to the date but I suspect older than 1700. Another style of Ink bottle in olive green coloured glass with some nice air bubbles. There are two ridges in the top for resting the pen. This one found on a dump dating from c.1880-1910. The rim is a shear-top type from manufacture processes where taken off the blowing rod. There is a slightly larger chip in this as seen in the picture although not too noticable. Condition is good and with a gentle wash it will come up even better. Heavy stoneware clay bottle marked with a stamp of the makers in Lambeth, London with 39 (size?). These came in many sizes and glaze textures, this being a more typical medium size. Height x Width in millimetres: 110 x 55. Condition is fair. The surface texture is glossy/pitted from manufacture. BAR British Series 192, 1988. 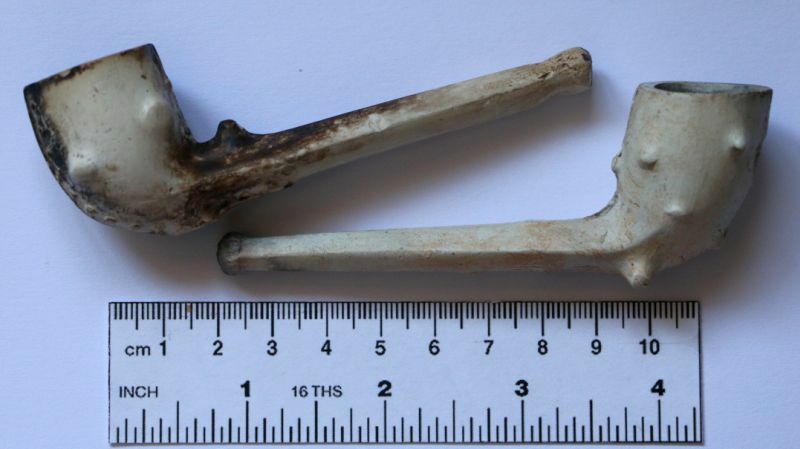 The Archaeology of the Clay Tobacco Pipe. XI. Seventeenth and Eighteenth Century Tyneside Tobacco Pipe Makers and Tobacconists, by Lloyd Edwards. 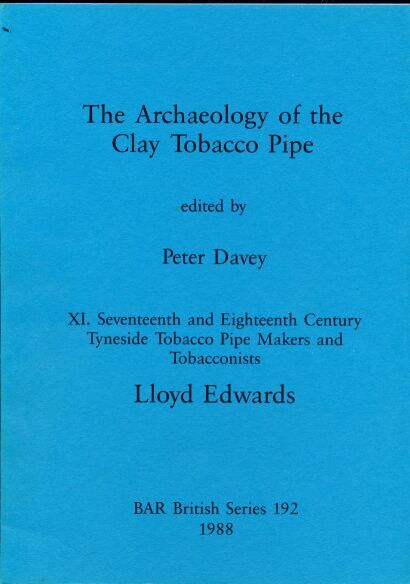 This is a very hard to get hold of archaeological publication from 1988, and ideal study material for those specialising in the subject of regional clay tobacco pipes in the Tyneside area of England. The publication of 164 pages contains a lot of information relating to pipe makers and their marks as well as lists of the makers and the times they were operating - births, marriages, death etc. There is also a good section listing Tobacconists too. While there are no actual drawings of the pipes there are a great number of neat drawings of the marks from the pipes shown which can help in identification. Condition of the book is very good indeed, hardly used. 21 x 29cm size with 164 pages, soft cover. professional reports of investigations, lots of black & white photographs as well as diagrams, maps etc. 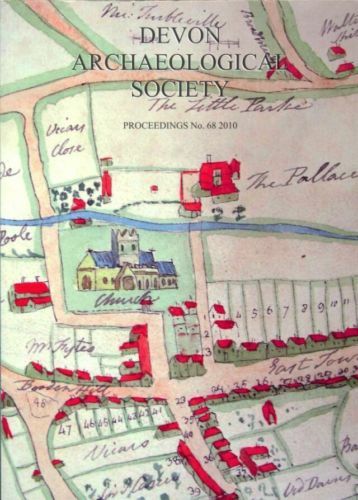 Ideal reading for local historians or researchers. 4. Iron Age hillfort of Berry Ball. 5. Dyers, Fullers and Brewers - Tudor Street, Exeter. 6. 94 Vauxhall Street Plymouth, Early 19th Century Warehouse and Office. 9. Cache of early clay pipes from Appledore. JUST ONE COPY AVAILABLE. price includes postage and packing. Copy of this publication which is in a hardly used condition. 1. Neolithic Assemblage from Tiverton. 2. Neolithic Sherds and Lithics from Merrivale. 3. Prehistoric and Roman material from Lundy. 4. Iron Age and Roman Settlement at Cullompton. 5. Roman Roof slate Quarry at Ipplepen. 6. Medieval Moated site at Wonford Exeter. 7. Investigations around Crediton Parish Church. 8. Metalworking and Debris on land near Castle Dene. 9. Admiral Vernon Inn, Exeter. 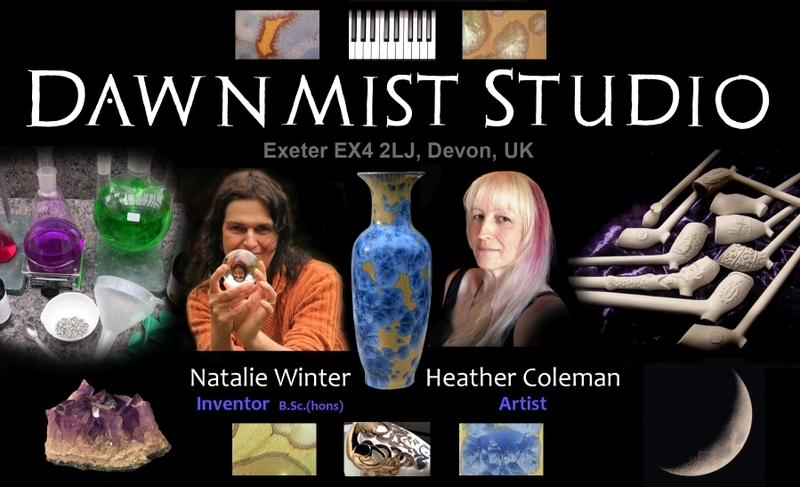 Heather Coleman is an artist, amateur archaeologist and clay pipe maker living in the county of Devonshire in England. she has collected and studied clay tobacco pipes on and off for over 35 years and her knowledge and enthusiasm are shared with you on this CD. If you have found clay pipes while walking the dog or digging the garden, or have collected them for some time and want to find out more about them then this CD is ideal for you. 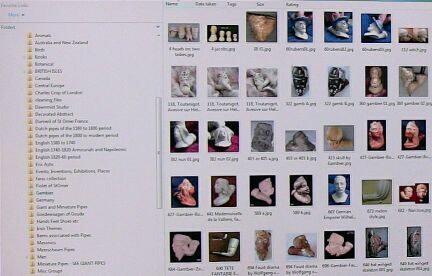 Also helpful to Museum Curators, artists, archaeologists and those wanting to explore material for their own studies. Smokers and dealers of tobacciana will also find my CD of interest. Photo galleries which are constantly being updated with over 7000 pictures now! Sections devoted to more recent clays still being made by pipe makers all over the world. 378 precisely drawn illustrations with many associated photographs. Finds from all over the British Isles are grouped County by County. A history of clay pipes and how they were made. How to find, clean and identify. Dozens of books are listed along with a summary of their contents. WWW links and contacts are also included. My own pipes which I make are also covered with dozens of pictures taken of the studio. Readers on the WWW can also send in photographs of their pipes and collections to add to future releases of this CD. The CD was first released in 1999 and is revised every year. Suitable for any PC equipped with CD ROM drive and Web Browser. SVGA (or better) Display with 24 or 32 bit colour gives best results with the pictures. During 2001 I was granted permission from two land owners in the Exeter area to search plough soil for clay pipes. One of the sites was on a hill near an old farm just east of the city and the other site on fields by the river at Topsham. This is my own short archaeological report covering clay pipes from the two sites. 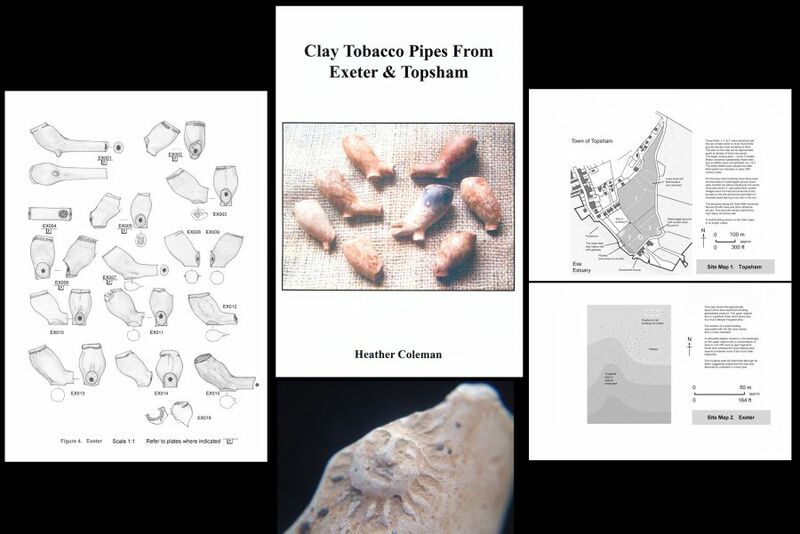 Approx 100 clay pipes/pieces were drawn from the two sites, mostly of the 1600-1750 period and show the typical Exeter styles found. The predominant styles before about 1800 were plain with a line of milling around the rim and a large flat heel. 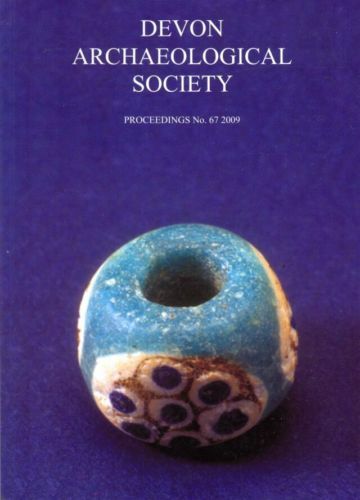 It is hoped that this work will find it's place among other reports on regional English clay pipes and will compliment work by other researchers as well as shedding light on new bowl forms. 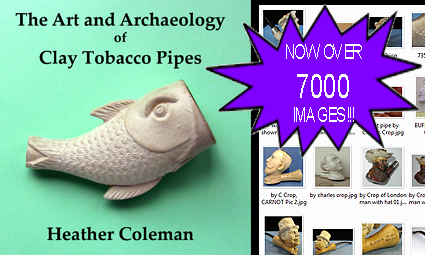 Clay Pipes made by Heather Coleman for Smokers, Collectors, Films and TV Documentaries etc.